Conservative talk radio host Rush Limbaugh absolutely trashed Wolf Blitzer Tuesday for ignoring Barack Obama's declining poll numbers. As he opened the program, Limbaugh informed listeners about new data showing the President's approval rating at the lowest point since he moved into the White House. "He's down to 44% in a couple of polls, 46% in another, and where is the State-Controlled Media reporting this?" RUSH LIMBAUGH, HOST: Let's go back audio sound bite wise, this is a good reminder, ladies and gentlemen, because President Obama has hit an all-time low in his approval numbers now. He's down to 44% in a couple of polls, 46% in another, and where is the State-Controlled Media reporting this? They are ignoring Obama's plunge, and it is a plunge in the approval numbers. March 13th of 2006, however, Wolf Blitzer on The Situation Room, a montage of discussion about President Bush's job approval numbers. WOLF BLITZER, CNN: It's 4 p.m. here in Washington. So you're getting the first look right now at our brand-new poll. The president's job approval rating has taken a downward turn again, falling to only 36%. [break] This represents his lowest rating ever in the CNN/USA Today/Gallup poll. [break] The president's poll numbers are pretty bad, pretty awful right now, rock bottom as far as the CNN/USA Today/Gallup poll. [break] The president's Iraq problem and his new low point in the polls. [break] His approval and policies now are at new lows. [break] The president's job approval number in this new CNN/USA Today/Gallup poll, rock bottom, the lowest it's ever been. [break] It's 5 p.m. here in Washington where President Bush takes a beating in our latest poll. His approval rating at a low ebb. [break] Our latest CNN/USA Today/Gallup poll just out in the past hour shows the president at an all-time low. [break] His job approval rating at a new low. [break] That's rock bottom as far as our poll is concerned. [break] It's 7 p.m. here in Washington. The war in Iraq comes home to roost for President Bush. Our latest poll numbers showing his approval rating at a new low. [break] Also: President Bush hits a new low in the polls. [break] Now back to our lead story: President Bush's approval rating now at an all-time low. [break] As we noted, a new CNN/USA Today/Gallup poll shows his job approval rating at a new low. [break] President Bush's approval rating at a new low, 36%. 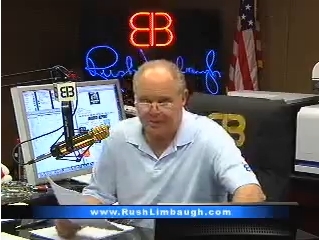 LIMBAUGH: All of that on March 13th of 2006. Wolf Blitzer, it's 4 p.m., lead story, Bush poll numbers. It's 5 p.m., lead story, Bush poll numbers. It's 6 p.m., lead story, Bush poll numbers, it's 7 p.m., lead story, Bush poll numbers. Now back to our lead story, Bush's approval numbers at an all-time low. Now here's the coverage of Obama's new low in the polls as covered on CNN's Situation Room with Wolf Blitzer yesterday. LIMBAUCH: That's right, nothing but crickets. They haven't reported it. Well, what was being reported by Wolf Blitzer on The Situation Room yesterday and last night? Well, here's a montage. BLITZER: Sarah Palin's tea party cheat sheet. Her political future may be in her hand. [break] Sarah Palin's sleight of hand at the weekend's tea party convention. [break] A most unusual cheat sheet. You might say Sarah Palin had tea partiers in the palm of her hand. [break] See all these papers? These are all notes and stuff I'm supposed to say, but I don't write it on my hand. [break] The answer is in the palm of her hand. Sarah Palin has a cheat sheet. [break] We'll look beyond the talking points on Sarah Palin's hand. I'm Wolf Blitzer. You're in The Situation Room. LIMBAUGH: No bias in the media, right? There's no advocacy in the media, and there's plenty of objectivity in the media. Are we all agreed on that? I have notes here, said Wolf, I got notes, I got more notes than Sarah Palin, but I don't write 'em on my hand. They're just beside themselves. You know, I wonder if he did write Bush's poll numbers on his hand, as often as he reported that back in March of 2006. According to LexisNexis, Blitzer did indeed discuss Bush's sagging polls during the hours Limbaugh discussed. Of course, as CNN used to be affiliated with the USA Today/Gallup poll, its coverage of such numbers is not necessarily surprising. But, in the past two weeks, as poll after poll has shown Obama's numbers similarly plummeting, Blitzer has not mentioned the President's approval rating once. By contrast, during the same period, Blitzer reported polls referring to the public's view of Sarah Palin, the Tea Party movement, gays in the military, the stimulus plan, and expectations for Obama's State of the Union address. I guess the formerly most trusted name in news has to have its priorities.